Commitment about ingredients? Quality ingredients from all over the world? Akai Bohshi has gained trust from the customers for its good taste and quality. The most important issue for us to ensure the trust is selection of ingredients. It is said that what determines the taste of baked cookies are firstly the ingredients, followed by the techniques to make use of them. We Akai Bohshi, through our trading division, search for the best possible ingredients including chocolates, nuts and butter all over the world and directly procure such ingredients for the baked cookies from trusted producers. Such a direct procurement without any intermediaries has been made possible only because we have built stable and reliable relationships with such producers. This has been done to keep our commitment to constantly deliver cookies of good taste and reliability to customers. Commitment about baking? Slow and deep baking is our first priority? As stated above, it is said that what determines the taste of baked cookies are firstly the ingredients, followed by the techniques to make use of them. Akai Bohshi prioritizes making the best cookies than anything else such as time and efficiency; therefore we have chosen to bake them slowly and deeply to extract the best taste from the selected best ingredients. Cookie dough frequently changes its state by temperature and humidity. Bakeries often bake a lot of cookies at one time for short time for efficient production. However, Akai Bohshi always pays attention to the state of cookie dough, and bakes cookies at the appropriate temperature for sufficient time to extract the best of the flavor, smell and taste. Commitment about quality? Measures for safe and trusted production? Customers’ safety and trust is our first priority. Akai Bohshi has implemented a system that ensures a comprehensive traceability in procurement and production, and we can trace our products from its expiry date, production date even to the lot number of the ingredients of them. 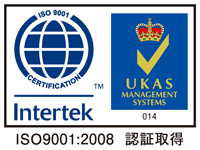 To gain more trust, our production facility acquired ISO 9001 certification, an international quality assurance standard in 2013.